Conference folder given to all attendees. Tuesday brought the first marquee event of the Itinerant Archivists’ sojourn in Ecuador: the inaugural conference of the Ciclo Internacional de Conferencias called “Archivos históricos y la valoración de las fuentes documentales” (“Historical Archives and the Valuation of Documentary Sources”) held at the Pontificia Universidad Católica del Ecuador, PUCE. The day-long conference presented the opportunity for a more formal interchange of ideas and experiences between the North American and South American archivists, historians, students, and scholars. 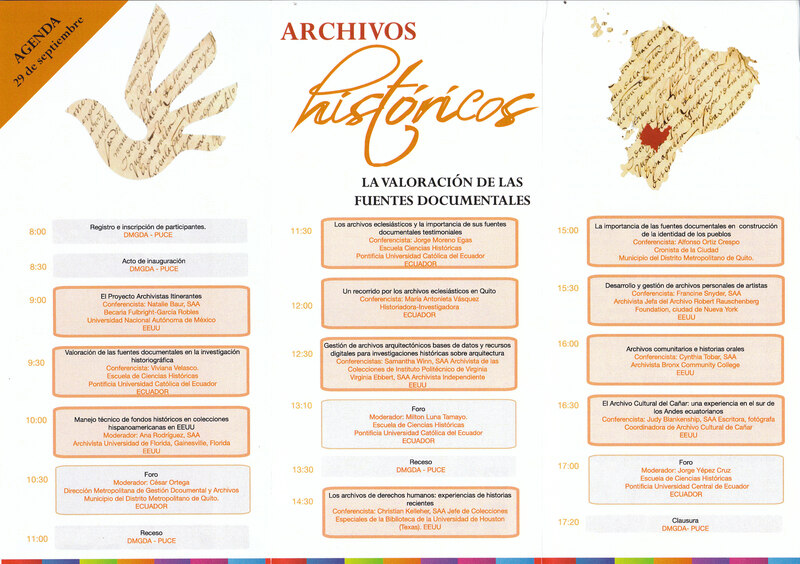 Itinerant Archivists co-founder Natalie Baur presents at the Ciclo Internacional de Conferencias: Archivos Históricos symposium at the Pontificia Universidad Católica del Ecuador. 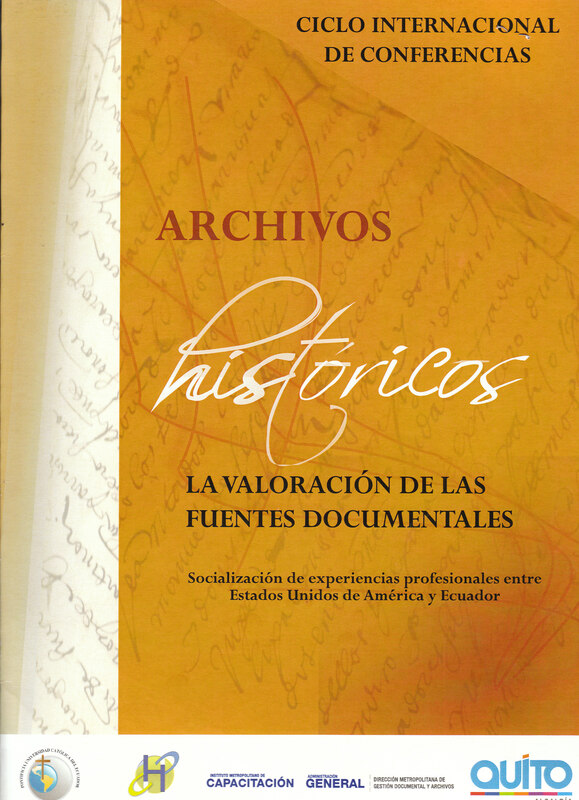 Highlights from our Ecuadorean colleagues included historian Viviana Velasco’s challenging and inspiring presentation “Valoración de las fuentes documentales en la investigación historiográfica” in which the PUCE professor espoused the importance of recognizing the context given by an archive or manuscript repository—including the increasingly important contextualizing work of appraisal for digitization and cataloging metadata that is (or isn’t) reflected online with digital or digitized fonds—that provides necessary cues to understanding the meanings of the documents and to interpreting the historical record. 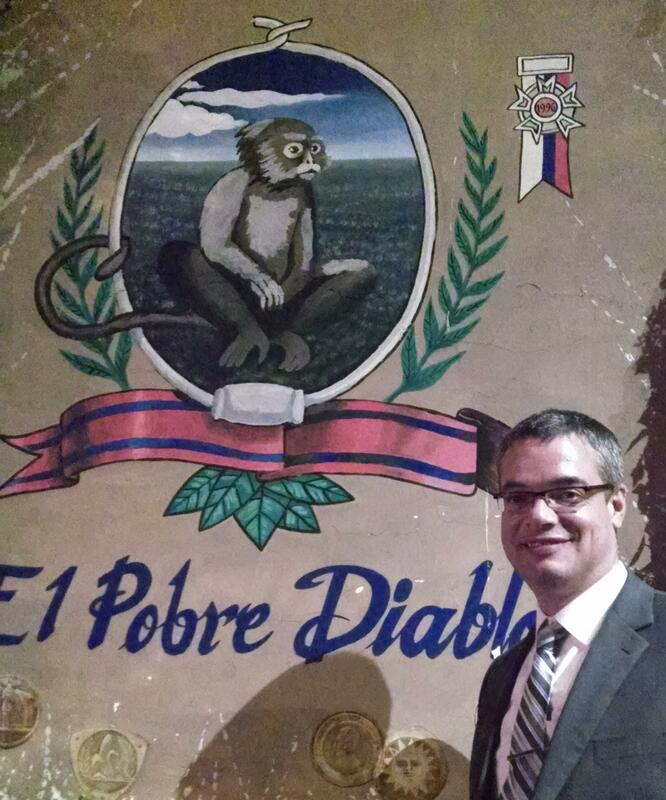 Two scholars, PUCE’s Jorge Moreno Egas and historian María Antonieta Vásquez considered Ecuador’s ecclesiastic archives and the varying, though inevitably crucial roles that the Catholic Church has played in the creation, preservation, and sometimes occlusion of the nation’s documentary record. And Alfonso Ortiz Crespo, the city historian whom we had met on Monday at the municipal archives, recounted through documents, drawings, and paintings the architectural history of the building in Quito’s historic center that the municipality is working to make its new archival repository. A highlight of the conference and taste of things to come for the Itinerant Archivists was community activist Judy Blankenship’s presentation on efforts to create an archive with the indigenous Cañari community in the Andes. Historical images and her own documentary photographs enlivened the audience and sparked spontaneous discussions among conference attendees who were inspired by the potential of such an archive. Moderators César Ortega, Milton Luna Tamayo, and Jorge Yépez Cruz summarized and responded to these and the Itinerant Archivists’ presentations (on Latin American and Caribbean archives in the U.S., architectural archives, metadata and digital projects, and community, human rights, and artists archives projects). In the end everyone left well-satisfied with their official certificates of participation in the day’s proceedings. 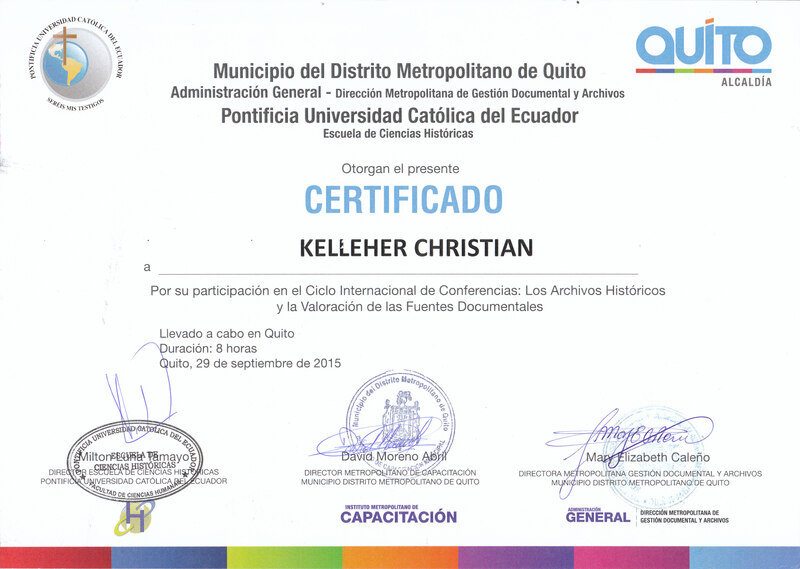 The author’s certificate of participation in the day’s events.